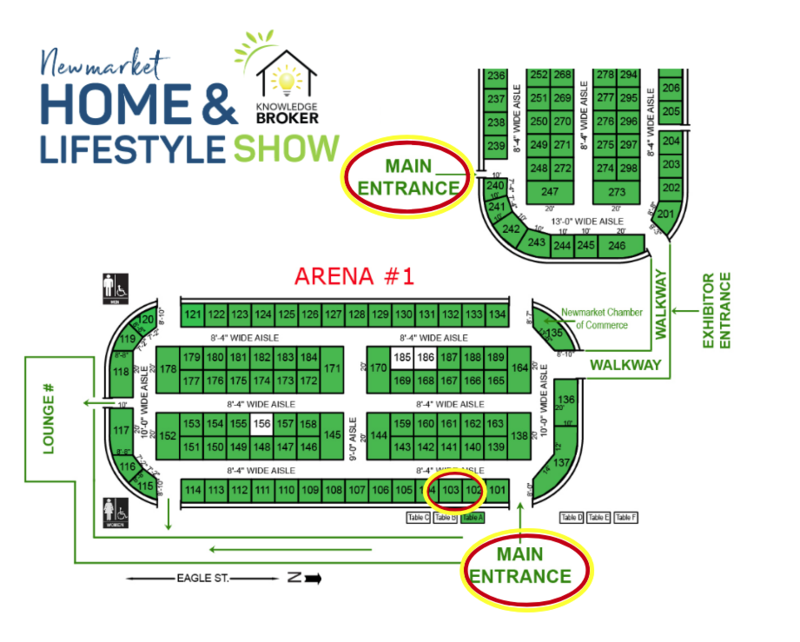 Come and ask about our SPRING SPECIAL – our best promotion of the year – at York Region’s largest home show in Newmarket. Save the HST – for a limited time. The show takes place March 29 – 31 at Ray Twinney Recreation Complex. Get a coupon for a second entrance – free here. Come and visit us at booth 103. 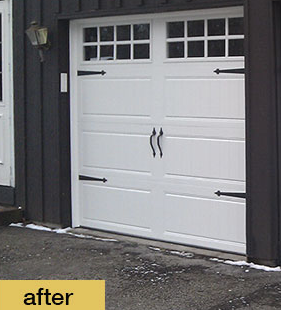 Stop repainting the frames around your garage doors. Cap them! 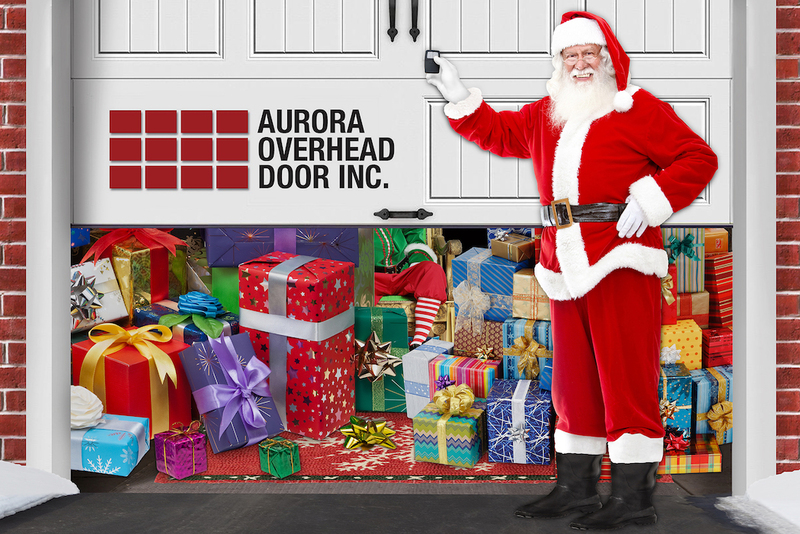 If you are tired of repainting your garage door frames year after year, then Aurora Overhead Door has the solution for you. Capping is metal sheathing that weatherproofs the frames and makes them look sharp. 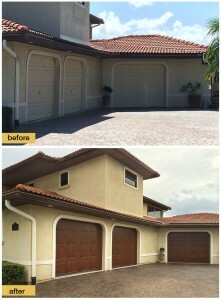 The wood underneath is protected and will last a long time without maintenance. We have lots of colours to choose from. Contact us today for more details. 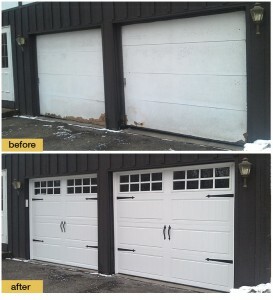 Here is an installation we just completed in Aurora, before and after. 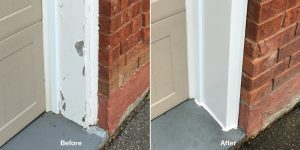 The wooden door frame is thirty years old, has been banged up and the paint is thick and peeling. The capping squares off the corners and makes it look like new! When a door into your home enters from the garage it offers an easy way for burglars to break in. A burglar can easily release the latch on an overhead door opener using a coat hanger. Here is a video that describes how you can prevent the latch being opened by using a plastic tie. 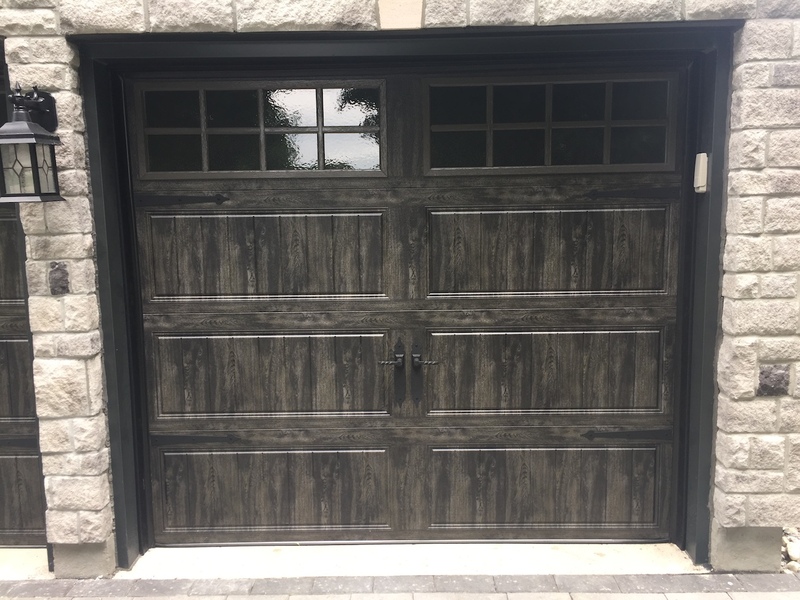 You can also install a piece of wood that makes it more difficult to reach the latch. 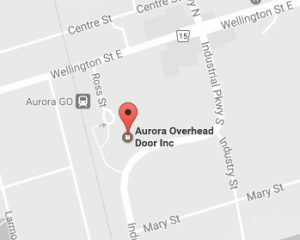 When Aurora Overhead Doors installs garage doors you have the option to have weather stripping and other ways to increase security. Please inquire. 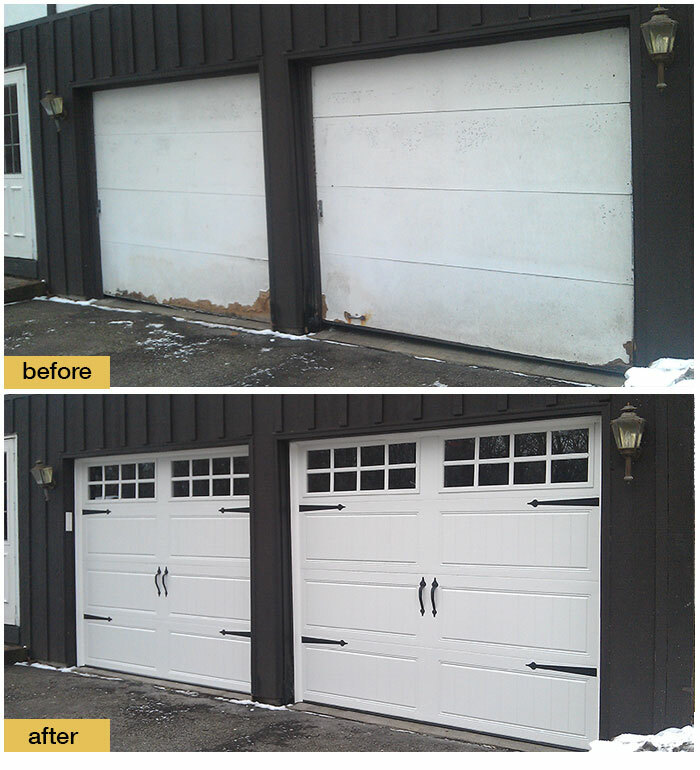 Also remember to keep your garage door closed when you are working around your home. 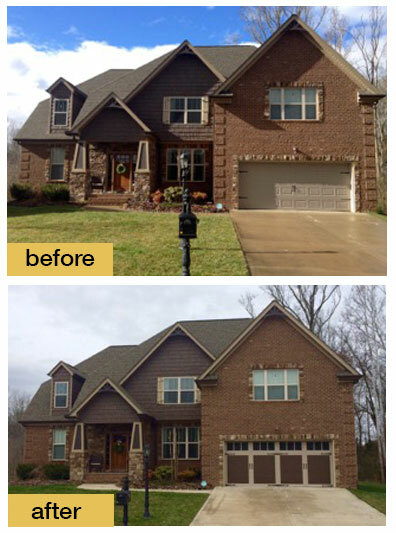 An open door is an invitation to burglars to come and help themselves to items you store there. Here is a video from a Wichita TV station that describes the dangers. 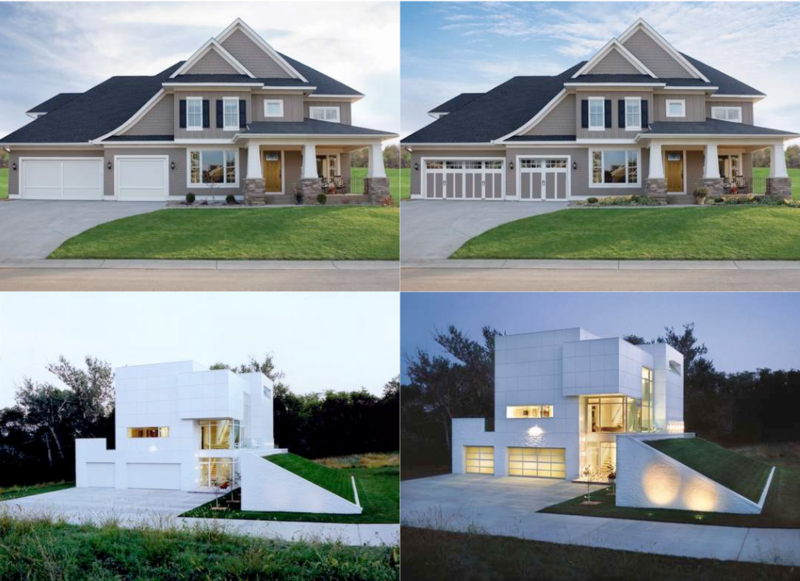 Here are some before and after pictures from Clopay Doors’s photo contest. 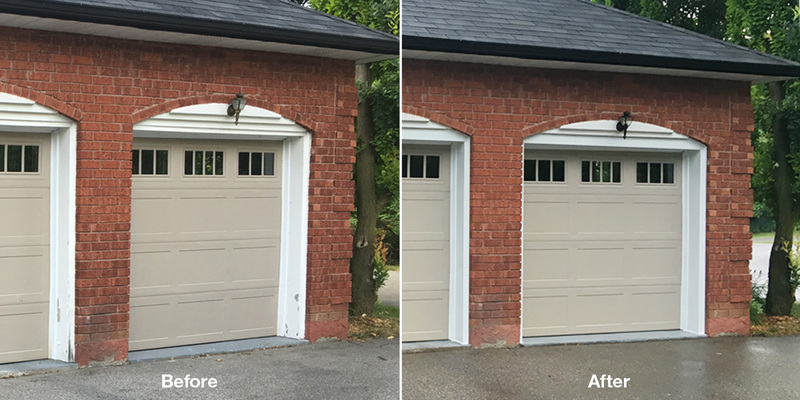 Anyone in your neighbourhood – Richmond Hill, Newmarket, Oak Ridges, Aurora – in need of a garage door makeover? Ask them to call us.